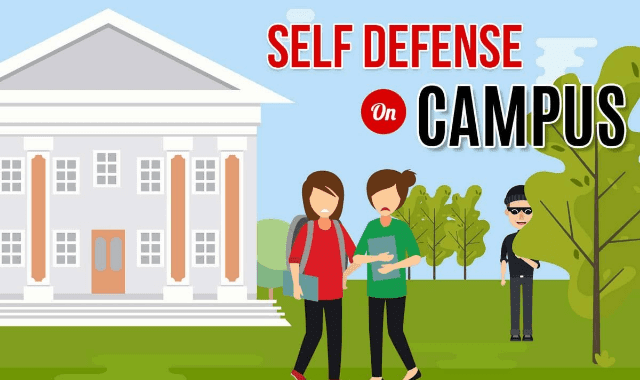 Self Defense on Campus #Infographic ~ Visualistan '+g+"
Every year students on college campuses are victims of violent and nonviolent crimes. These crimes span from aggravated assaults, robberies, forcible rapes to murder or non-negligent murder. Although, college campuses are continuing to add to students’ safety by implementing ‘Panic Phones’ and increasing campus police presence there are still a few actions students can take to help ensure their safety. When traveling in and around college campuses students should walk in groups, stay alert to their surroundings and carry a self-defense product such as mace or a keychain pepper spray. The following infographic from High Tech Safety provides a few statistics on college campus crimes, tips for staying safe and self-defense tips for students.